I have been called upon to settle more than one argument regarding what golfers may touch with their club in a hazard. Remember that there are two types of hazard on a golf course, bunkers and water hazards (which include lateral water hazards) and that strokes (where there must be intent to strike at and move the ball) are different from practice swings. Most golfers know that if their ball lies in a hazard they must not touch the ground in that hazard, or the water if it is a water hazard, with their hand or club. Most golfers also realise that they must not touch or move any loose impediment (e.g. stones, branches and dead leaves) lying in or touching the same hazard, unless it is with the forward movement of their club as they make their stroke. However, in my experience, many players do not realise that there is no penalty for touching anything that is growing with a practice swing, their backswing, or the forward movement of their club before it strikes the ball, even when their ball is lying in a hazard. Of course, the player must not do anything to improve their lie, area of intended stance or swing, or line of play by moving, bending or breaking anything growing, because this would be a breach of Rule 13-2. So take care during those practice swings! A memorable instance of a breach of Rule 13-4, by moving a loose impediment in a water hazard, occurred in 2010 on the first playoff hole at the Verizon Heritage. On the backswing of his stroke, Brian Davis slightly moved a single loose palm frond, lying amongst several growing palm fronds (see photo). Davis had to call the two strokes penalty on himself resulting in him losing the title to Jim Furyk, who was not even aware of the infraction. 1.… touch water in a bunker on their backswing? 2.… touch sand in a bunker on their backswing? 3.… touch growing grass in a bunker on their backswing? 4.… touch loose grass in a bunker on their backswing? 5.… touch water in a water hazard on their backswing? 6.… touch sand in a water hazard on their backswing? 7.… touch growing grass in a water hazard on their backswing? 8.… touch loose grass in a water hazard on their backswing? Answer: A penalty is incurred in 2. 4. 5. 6. 8., but not in 1, 3 and 7. The penalty is two strokes in stroke play or loss of hole in match play. I am pleased to say that I have now published my follow-up book as an eBook. It is not yet available from my Rhodes Rules School web site, but if you email me direct (at rules at barry rhodes dot com) I will send you the .pdf file by return and, after payment has been received, a link to collect the .mobi file, which, because of the many photos and diagrams is too large to send by email. The .pdf file can be printed out from any computer and the .mobi file can be used with the free Kindle app to transfer the book to any eReader, smart phone or tablet. The charge, depending on which currency is the easiest for you to pay by PayPal, is US$10.99, Eu€9.99, or St£7.99. ‘999 More Questions’ is very different from my first book in that the questions, answers and references are grouped in sections of 9, covering every conceivable situation that golfers may encounter on the golf course (e.g. Dropping a Ball, Loose Impediments, Bad Weather, Rakes and Bunkers, Clothing and Footwear, Club-lengths, Handicaps, etc.). This format has proved to be the most popular of the three, free ‘Rhodes Rules School’ series that I email weekly to over 10,000 subscribers. I can promise that as you read through this book, taking one section of 9 questions at a time, you will obtain a better understanding of the Rules of Golf, which you can then take onto the course to improve not just your score, but also your enjoyment of the unique game of golf, where players are expected to respect and abide by the Rules more than in any other sport. Note: My original eBook, ‘999 Updated Questions on the Rules of Golf – 2016’ has just become available as a paperback on Amazon. Please take care to click on the latest (2016) version, as I cannot get them to remove the out of date editions. Note: If you are already receiving my ‘9 Questions About …’ series of free, weekly emails and you purchase ‘999 More Questions’, I will advance you to the current series of ‘Pros Getting it Wrong’. 1. can I ground the club? 2. during practice swing, on the downswing, can I cut off the grasses but it is not improving the line? 1. No, this would be a breach of Rule 13-4. 2. Yes. At any time, a player may touch anything growing in a hazard, providing they do not improve their lie, or areas of stance and swing. Very useful summary. Interesting that 1 (touching water in backswing in a bunker) incurs no penalty yet 6 (touching sand in backswing in a water hazard) does incur a penalty. This seems inconsistent. No inconsistency here. Water in a bunker is not 'ground' of the bunker, it is casual water, an abnormal ground condition, from which the player may take relief without penalty if they choose (Rule 25-1b(ii). part the grass tops to look for the ball? There is a danger of inadvertently moving the ball or improving lie/stance. 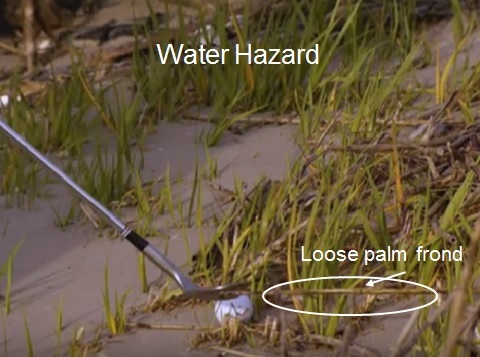 "In a hazard, if the player's ball is believed to be covered by loose impediments to the extent that he cannot find or identify it, he may, without penalty, touch or move loose impediments in order to find or identify the ball. If the ball is found or identified as his, the player must replace the loose impediments. If the ball is moved during the touching or moving of loose impediments while searching for or identifying the ball, Rule 18-2 applies; if the ball is moved during the replacement of the loose impediments, there is no penalty and the ball must be replaced."